In addition to our karate and cardio kickboxing programs, ALL PKA schools offer corporate personal safety seminars, summer camps and birthday parties. Our personal safety seminars and birthday parties are available to anyone interested – you don’t have to be a karate student to attend! Please check out the information below for more details. Let us help plan your next birthday party! 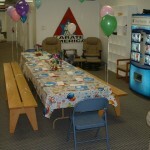 Plumer Karate America offers three party packages designed to help make your child’s party a huge success! 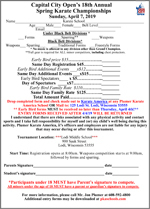 With karate drills, team building drills, games and more. We can customize your party to fit any needs, from customized cakes, pizza, hot dogs, etc. All of our packages are for up to 25 children and we even do the invitations for you! Packages start as low as $99 and dates do fill up quickly so don’t hesitate, call the location nearest you and get started towards your child’s dream party today! Americans are becoming increasingly concerned about their personal safety and the safety of their loved ones. With some basic knowledge of self-defense skills along with quality information about what attackers look for in a victim you’ll feel more confident no matter what your situation! This corporate seminar is designed to offer basic self-defense information to groups of co-workers either in our facility or yours. Attendees will focus on using visual, physical and mental self-defense. This seminar will also focus on how to NOT become a victim. Learn quality information about what characteristics attackers look for in a potential victim and how to change your behavior. Seminars a limited to 30 people with a student to instructor ratio of 10 to 1. * Seminars are two (2) hours in length with a 10 minutes break halfway through. Customized seminar lengths are possible. * Carpet or workout mats are ideal. However, non-slippery tile or wood floors are fine. * Larger groups are possible with the addition of assistant instructors. The seminars will be lead by a qualified, certified Black Belt Instructor. Karate America summer camp is for ALL karate students regardless of belt rank. If you desire to improve your skills, make new friends and have tons of fun, this camp is for YOU! Our week will focus on gymnastics, focus drills, basics, fun, goal setting and fun! Summer camp is designed for those students who have the desire to improve – plain and simple. 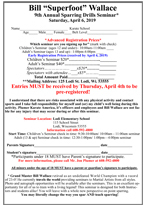 Stop in the office for more information, to pick up registration forms and to reserve your spot. Hurry! Sessions are filling up fast and there are limited openings! Open to both karate and non-karate students. Please call appropriate school for additional info and schedule.